Dost Thou in a Manger Lie? “Dost Thou in a Manger Lie?” are the opening words of Elizabeth Rundle Charles’s (1828-1896) translation of the Latin hymn, “Heu! quid jaces stabulo” by Jean Momboir (Johannes Mauburnus, John Mauburn, 1460-1503). Momboir was a Belgian monk and abbot whose 1491 treatise, Rosetum Spirituale (The Spiritual Rose-Garden) made him widely known. “Dost Thou in a Manger Lie?” is an excerpt of three stanzas from a 13-stanza poem in the Rosetum Spirituale. 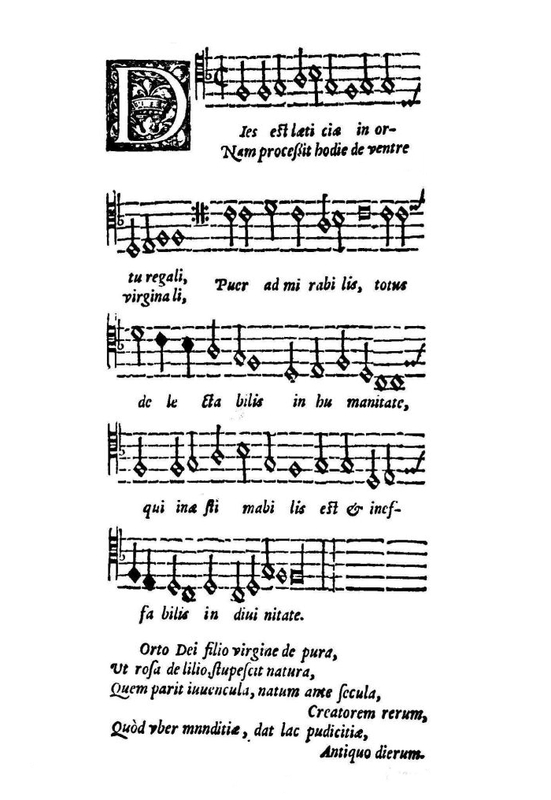 The tune that is the basis for this arrangement is from the 1582 collection of medieval Latin songs, Piae Cantiones, where it accompanies the text “Dies est Laetitiae” (“This is the Joyful Day”), which like Momboir’s poem, is a song that celebrates the nativity of Christ. To view a larger scanned image (.jpg) of “Dies est laetitiae” from Piae Cantiones, click or touch the image to the left (opens in a new window). For a comparison of Momboir’s hymn and “Dies est Laetitiae” in both Latin and English texts (pdf), click or touch here (opens in a new window). As theologically rich and evocative are the texts, so as simple and lovely is the tune. Attractively harmonized, this arrangement displays many colors of the woodwind quintet.